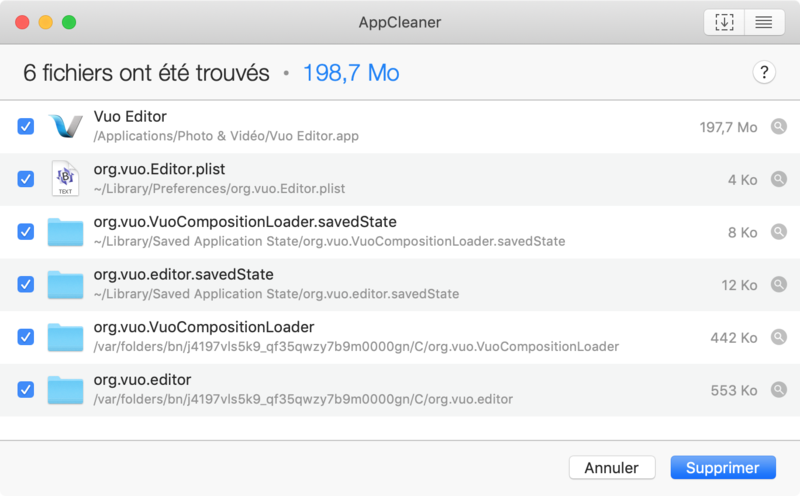 Maybe try AppCleaner to uninstall Vuo before re-installing it. Uninstall any subcompositions/nodes you have installed. Go to Tools > Open User Modules Folder. If there are any files in there, move them out of the folder. Do the same with Tools > Open System Modules Folder. Go to Finder (e.g. click on the Desktop). Go to the Go menu and hold down the Option key, and select the Library option that appears. Find the Library > Caches > org.vuo folder and throw it in the trash. If that doesn't fix it, could you post the crash report? You could also check Console.app for any log messages from Vuo. As I already mentioned a tried all that the last night several Times. Also tried App Cleaner. The only thing that happens when I use app Cleaner is that Vuo ask me to activate again. After that immediately in the old loop. I noticed in the User Modules folder when I deleted all the nodes I wrote and try to start the Prorgamm again. All the files will be recreated. Here is a short Video off the crash loop. And the last Project i Worked on. I am really desperate now. I am really desperate now. Really need all that stuff tomorrow. Put a lot of work and many Nights on this Project now. And now the whole Programm won't work any more. Never exp. something like that with other programms on my mac. And now I really don't know what to do anymore. If this will apear more frequently I defently will get my money back for the Programm. Quartz Composer worked fine for several Years now. Okay tried it like 20 times and started mac in safe mode. After then trying it back in normal mode some how it worked again. Had this node with the Flashes EQ composition in it from the Community here. Deleted that node and everything worked again. DRDN, I'm glad you were able to find and delete the problematic node. If you still have the node, could you attach it to this bug report so we can figure out why Vuo crashed? In fact, it would help even more if you could provide all of the nodes you had installed, in case the problem involves multiple nodes. Kewl, thanks for the suggestion about AppCleaner. It seems like a useful tool in general, although in this case AppCleaner missed the folders where the problematic node would have been installed (either User Modules or System Modules). We looked into how the Vuo app could inform AppCleaner about those locations and, not finding any documentation, have asked the developers.